A beautiful 1923 Rolls Royce that is in outstanding condition and a real true vintage car fit to grace any wedding. 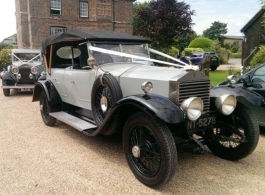 If you are looking for a real authentic vintage Rolls Royce as your wedding car then look no further than this vintage Tourer. The name Tourer is an old fashined term for open top or convertible, the roof of the car can be lifted up or down depending on the weather, this is an amazing car to have in your wedding day photos.